Nothing beats the dramatic beauty of a wedding on the water. 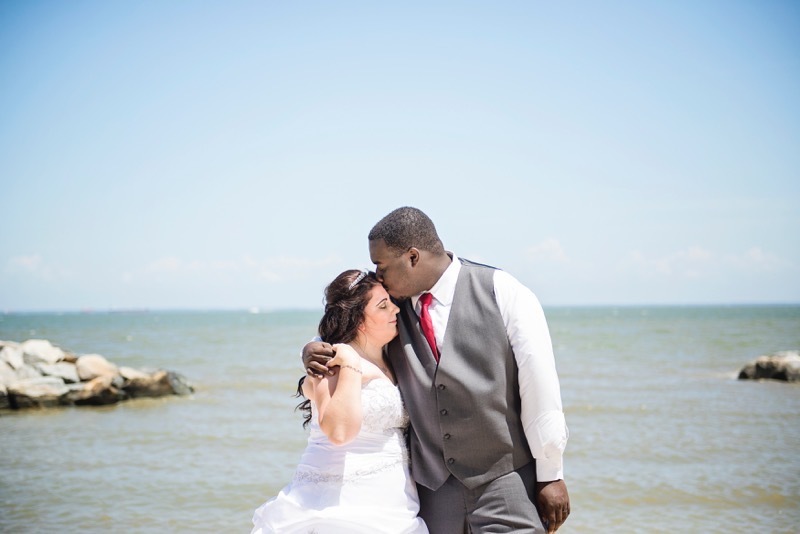 Learn more about seaside weddings in Maryland. Wye Island NRMA makes a beautiful backdrop to any ceremony. Image courtesy of Sugar Farm Productions. 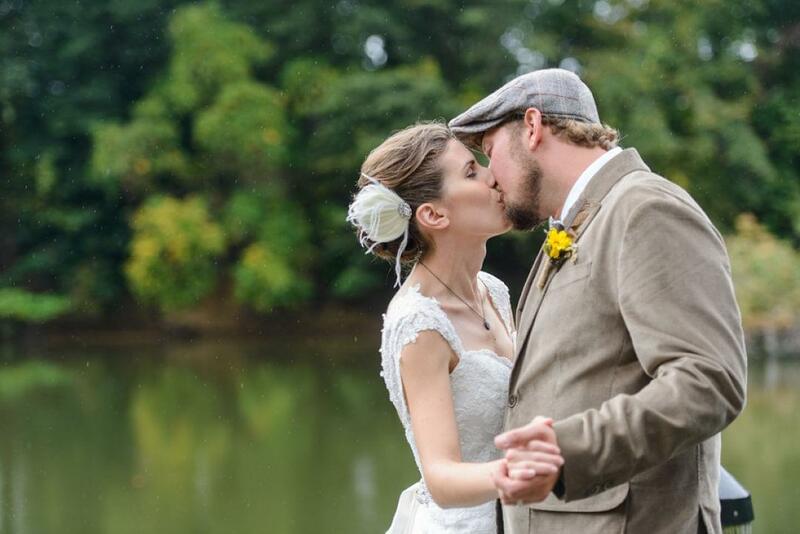 Tucked away in the tidal recesses of the Chesapeake Bay between the Wye River and the Wye East River, Wye Island is the perfect venue for an intimate ceremony. 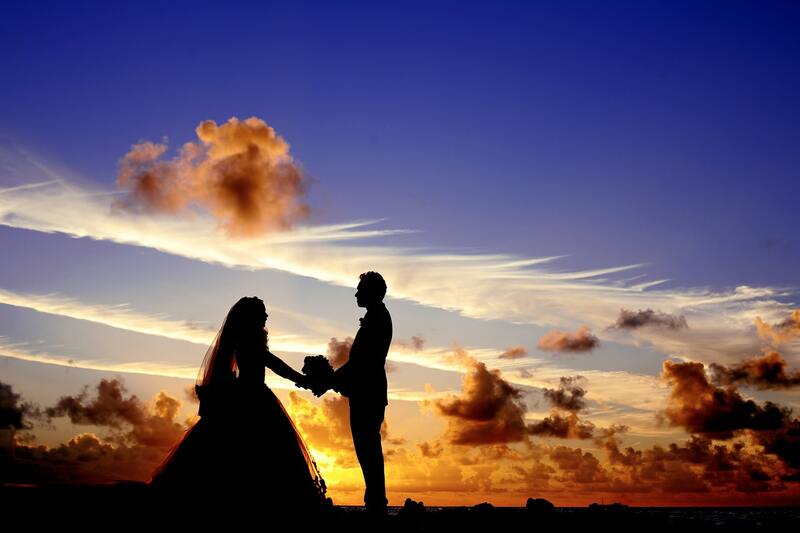 The island boasts countless picture-perfect views of the water as well as gorgeous forests and scenic lodges, which can be reserved for your special day. 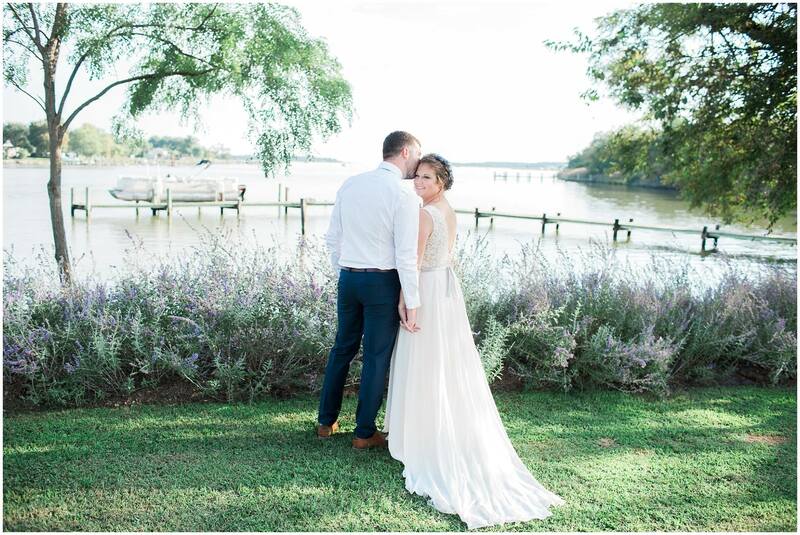 Wye Island is the perfect way to incorporate something old into your wedding-- the land was privately owned for more than 300 years, during which time it was used for agricultural purposes. During its long history, Wye Island has been home to vineyards, orchards, breweries, and ranches, which means there’s no shortage of scenic spaces for you to explore. 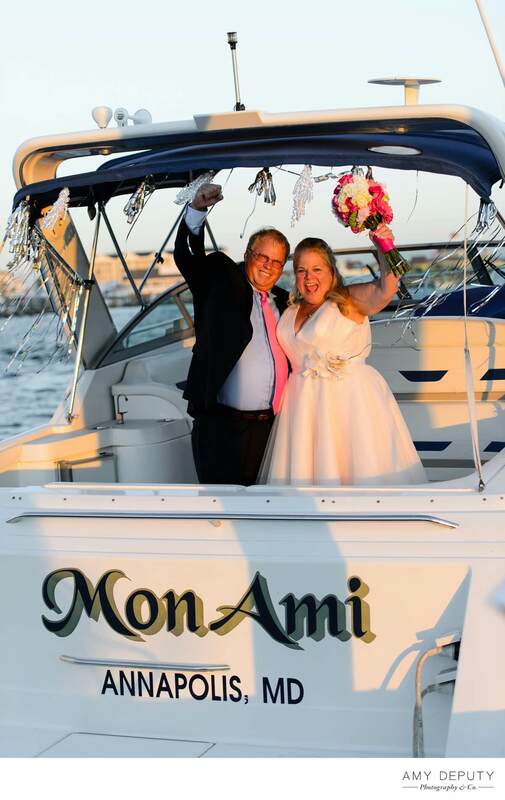 Happy couple Kathy and John making a grand exit from their Kent Island Yacht Club ceremony. Image courtesy of Amy Deputy Photography & Co. If you’re searching for scenic views of the water, look no further than Kent Island Yacht Club. The 10-acre peninsula retreat offers stunning views of the water on three sides. Kent Island is an affordable option, but that doesn’t mean it lacks character or quality. The Yacht club has a gorgeous waterfront facility with room for the ceremony and the reception of your dreams. The best part about Kent Island Yacht Club? They understand that wedding planning is a lot to tackle on your own! That’s why they offer a variety of packages to help take some of the stress off of couples. That way, you can spend less time fretting over the details of your big day and more time enjoying it. Couple Megan and Morgan enjoy a gorgeous ceremony on the water at Mayo Beach Park. Image courtesy of Britney Clause Photography. Are you look for the classic elegance of a traditional beach wedding venue? If you are, Mayo Beach Park is a breathtaking option. The venue is surrounded by sparkling water and pristine, sandy beaches. Mayo Beach also offers a panoramic view of the South River, making it the perfect backdrop for wedding photos you’ll be proud to display for years to come. Mayo Beach Glass Pavilion can accommodate up to 225 guests for a seated event. Newlyweds Kelsea and Sean enjoy a quiet moment following their ceremony at Swan Cove Manor. Image courtesy of Anthony Skelick Photography. Swan Cove Manor is a beautiful and unique option for your wedding ceremony or reception. The waterfront estate is home to 2 wonderful waterfront manor homes, each with 5 bedrooms, 3.5 baths, a private dock, and a swimming pool. One of the homes-- the Chart House-- was built in 1871, and its cheerful historic charm has been preserved during restorations. Coastal Swan Cove Manor offers unspoiled elegance that highlights the natural beauty of the Chesapeake Bay region in year-round ceremonies. Whether your dream wedding is formal or casual, set against a dramatic coastal backdrop or lush evergreens and expansive lawns, Swan Cove Manor is happy to meet your needs. 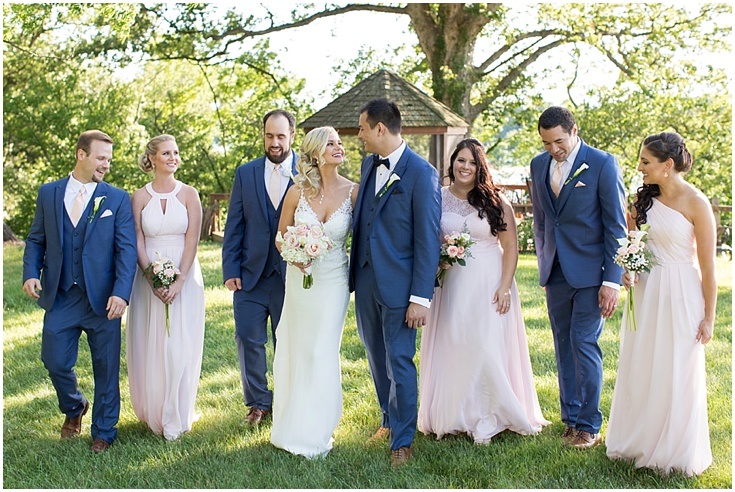 Couple Kara and Kyle pose with their wedding party on a beautiful summer day at Great Oak Manor. Image courtesy of Laura’s Focus Photography. Great Oak Manor is a truly unforgettable wedding venue. The romantic country manor house is hidden away on 12 acres of waterfront estate. Known for its stunning sunsets, the Great Oak Manor bluff overlooking the Chesapeake Bay is the perfect dramatic backdrop for wedding photographs unlike any you’ve ever seen before. 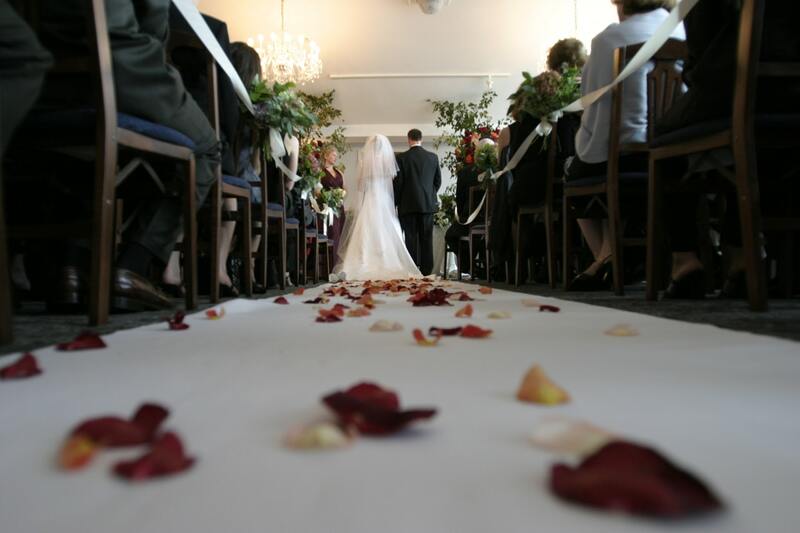 Open year-round, Great Oak Manor offers a variety of wedding packages for your convenience. 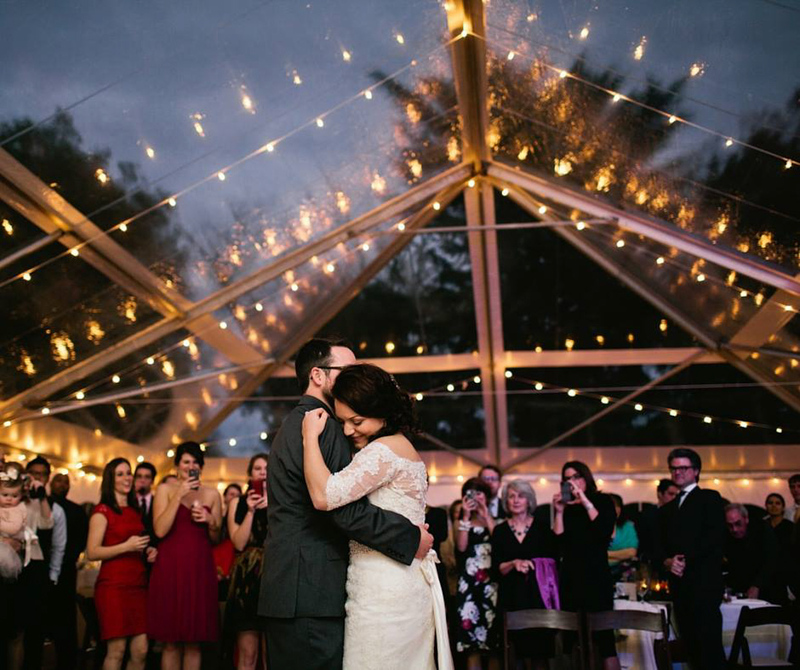 Whether you envision saying your vows under budding blossoms in the springtime, the warm coastal sunshine of summer, fiery autumn leaves, or even a gentle flurry of snow, Great Oak Manor can make that dream a reality. A couple says “I do” on the brick patio of Newton White Mansion. Image courtesy of Newton White Mansion. The Neo-Georgian Newton White Mansion is a beautiful brick mansion. It was built in 1939 and sits on 586 lush acres, which includes the Enterprise Golf Course. 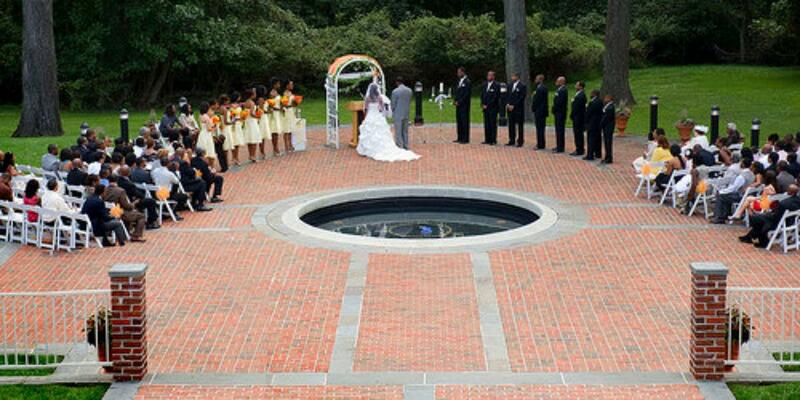 You can picture your outdoor ceremony on Newton White’s large brick patio with romantic details like surrounding gardens and its large central fountain. The Newton White Mansion also has plenty of space for your guests to explore during cocktail hour and all evening long. Newlyweds share a dance surrounded by family and friends and one of many beautiful venues at Brittland Estates. Image courtesy of My Eastern Shore Wedding. Lovebirds Caitlyn and Ryan take in the beautiful view from Cascia Winery. Image courtesy of RW Photography. When you think of wine, where do you think of? Do you think of rolling vineyards in the scenic south of France, or perhaps sprawling vineyards in the hillsides of California? Believe it or not, Maryland also has a long and storied winemaking tradition. In fact, the earliest account of winemaking in what is today Maryland predates the founding of our country by a long shot-- winemaking in Maryland dates all the way back to 1648! Mark Cascia Vineyards carries on this tradition by crafting premium red, white, and dessert wines right on Kent Island on Maryland’s Eastern Shore. Cascia Winery offers stunning views overlooking the sparkling Chesapeake Bay. The unique family-owned vineyard’s waterfront events facility provides the perfect vantage point to take in the area’s abundant natural beauty. The Chesapeake Bay Environmental Center at sunset. Image courtesy of the Chesapeake Bay Environmental Center. If you think that an environmental center isn’t a romantic wedding venue, you’ve never seen Chesapeake Bay Environmental Center. Located on more than 500 acres of untouched habitat along the Eastern shore of the Chesapeake Bay, Chesapeake Bay Environmental Center is a hidden gem. Sunset at the cozy facility is particularly picturesque-- watch the sun fade from the sky as you take in dazzling views of the Chesapeake Bay. 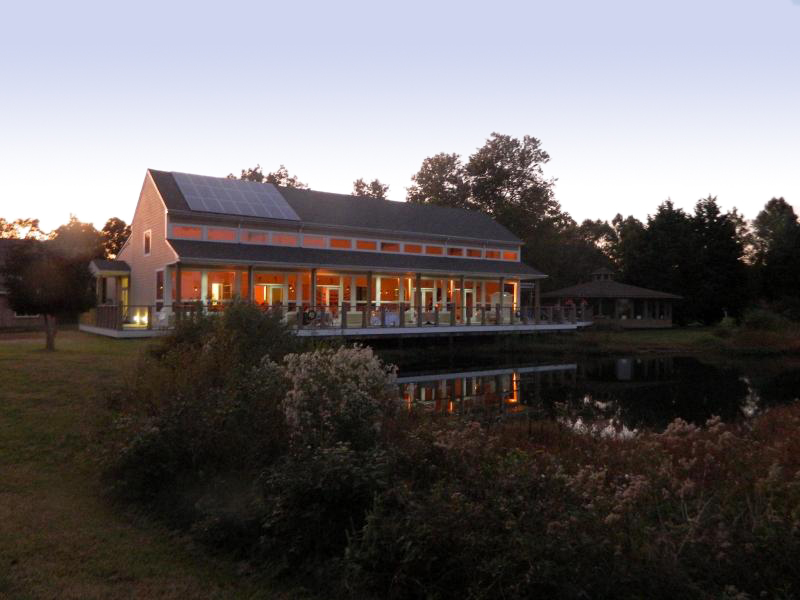 Chesapeake Bay Environmental Center’s “green” facility is contemporary and functional, but it’s also wrapped up in beautiful natural surroundings, making it an excellent choice for your big day. 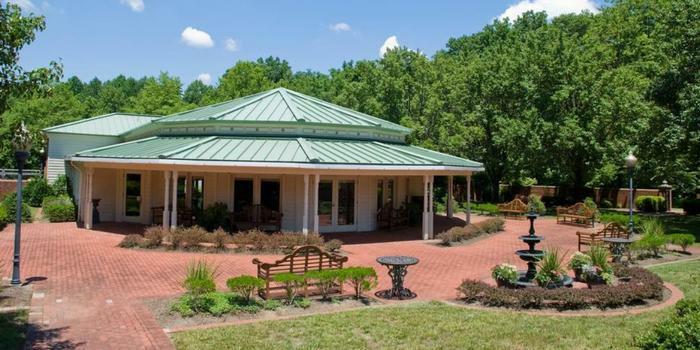 The Blue Heron Center is a great venue for couples who simply can’t choose between indoor and outdoor. Image courtesy of Karen Daily Photography. Everything you need to know about Quiet Waters Park is right in its name-- it is a beautiful, serene location, ideal for a cozy ceremony. The Blue Heron Center’s architecture will impress your guests from the very beginning with its stately columns and timeless brick stairway. The space features romantic details like a Victorian cast iron fountain, formal gardens, and tasteful decor. If you’re looking for a venue that brings together the best of indoor and outdoor spaces, this is it! 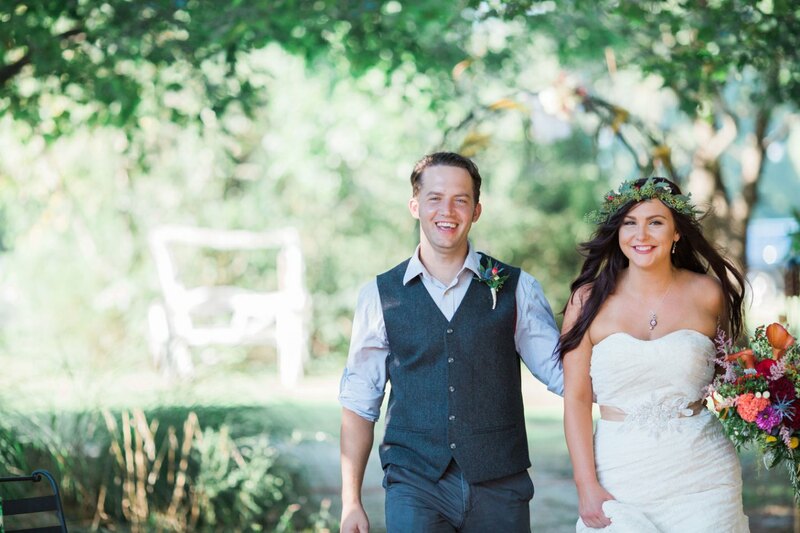 Sweet couple Courtney and Nick enjoy a cozy country wedding at Sinking Springs Farm. Image courtesy of Focus Bay Photography. Does your wedding require plenty of room to spread out? Nestled in the sprawling estate of Bristoll Plantation, Sinking Springs Farm is a charming and secluded wedding paradise. Nothing says romance quite like a rustic wedding. Plus, Sinking Springs is situated on 130 acres and can accommodate up to 450 guests, which means all of the important people in your life can be a part of your big day. Sinking Springs Farm boasts an incredible 18th-century provincial plantation log house. Its land is also home to a rustic barn with a bright and airy loft, perfect for pictures and receptions alike. But Sinking Springs Farm doesn’t just look good-- it smells good too! You and your honey will love exploring the lovely aromatic gardens on the grounds. Selecting the perfect venue for your East Coast wedding can be difficult-- after all, there are plenty of amazing options! 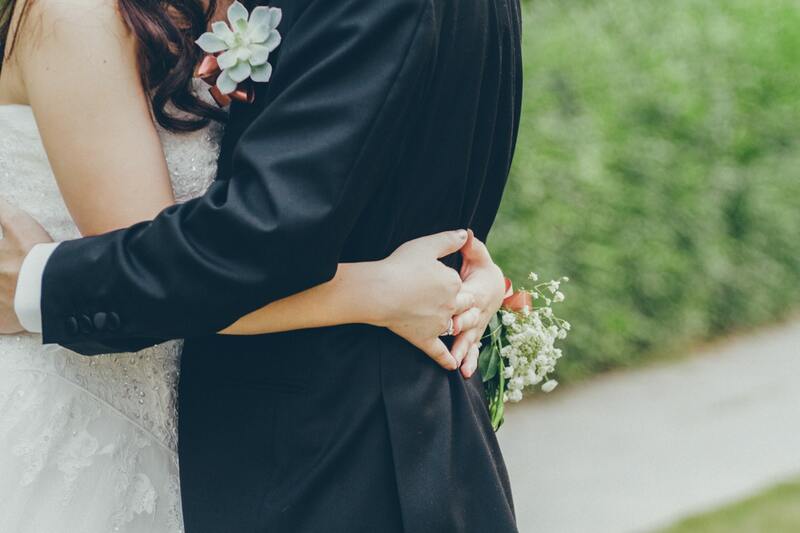 Whether you decide to exchange your vows on a serene beach or the sprawling grounds of a historic manor home, when you find the right venue, you’ll know. Regardless of whether your perfect venue turns out to be a winery, an environmental facility, or anything in between, The Smokehouse Grill can help you select the perfect BBQ wedding catering option for your big day. You can check out our popular wedding catering packages, or get a free quote for a BBQ wedding catering package. Every love story has that one magical moment-- the moment where you looked at your partner, and you just knew that they were the one. Maybe time seemed to slow down, or maybe your heartbeat sped up-- but either way, in that moment you knew you had found what you’d been looking for. The great thing about wedding planning is that gives you plenty of opportunities to relieve a little bit of that magic. Wedding planning is full of choices that need to be made with both the head and the heart-- finding the photographer, the caterer, and the venue of your dreams.